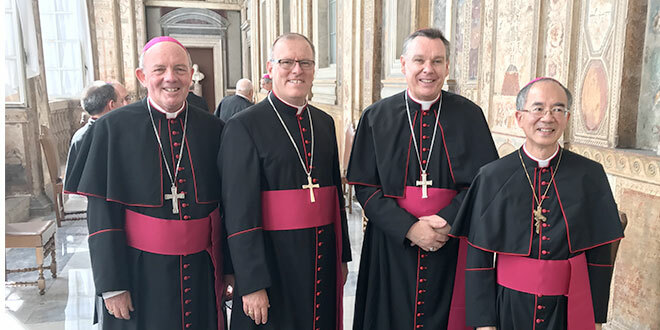 Aussie contingent: Bishop Michael Morrisey of Geraldton, Brisbane auxiliary Bishop Ken Howell, Bishop Tim Harris of Townsville and Bishop Greg Homeming of Lismore in Vatican City. BISHOPS don’t discern God’s will by lording over his flock, but only by listening and participating in the lives of those entrusted to his care, Pope Francis has told 120 new bishops including four Australians. Speaking at the end of the annual training school for bishops, commonly known as the “baby bishops school”, Pope Francis reminded the bishops to “cultivate an attitude of listening”. “I invite you to cultivate an attitude of listening, growing in the freedom to give up your own point of view – when it is shown to be partial and insufficient – in order to assume God’s,” the Pope said. Among the new bishops were four Australians, Brisbane auxiliary Bishop Ken Howell, Townsville Bishop Tim Harris, Lismore Bishop Gregory Homeming and Geraldton Bishop Michael Morrissey, the newest of the four episcopal leaders. Bishop Harris, who was a priest for the Brisbane archdiocese, said on his Facebook page that he shared with Pope Francis the respect of the people of the Townsville diocese. “He asked me to pray for him,” Bishop Harris wrote. Pope Francis received applause from all the bishops whom he had named to lead dioceses around the world. Bishop Howell said the gathering of 116 newly-ordained bishops from all over the world brought home to him in a concrete way, the broad dimensions of the Church. “Not only did we attend lectures together and share fellowship at meals, but significantly we gathered in Saint Peter’s Basilica for the celebration of Mass and to visit the tomb of St Peter,” he said. “Here, I think we all realised the magnitude of our calling to be apart of the College of Bishops. “At the end of our week long course we gathered in the Vatican Clementine hall to meet Pope Francis. “There he encouraged us in our mission as bishops and reminded us of the theme of our gathering which centred around the need for bishops to be masters of discernment. “A highlight for me was the moment when I finally met Pope Francis. “He patiently greeted and spoke with all 116 of the bishops and offered personal words of encouragement. “It was a moment for me to assure His Holiness that all of the Archdiocese keep him constantly in our prayers.